Of course you want to see Tiger Woods play in the Farmers Insurance Open at Torrey Pines Golf Course. But would you like a chance to see one of the greatest golfers of all time as he rehearses for a seventh win in the tournament, eighth overall at Torrey Pines counting his amazing victory in the 2008 U.S. Open? 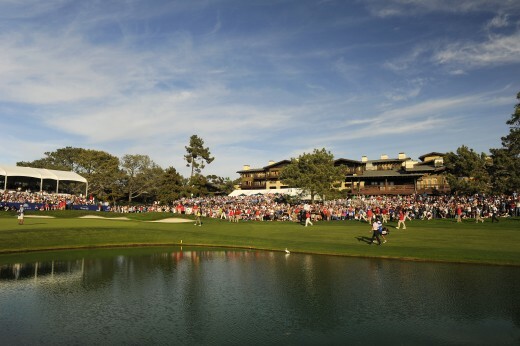 Catch the action of the Farmers Insurance Open. Photo courtesy of Stan Badz. To do that, you’ll have to get up very early Tuesday morning and head to Torrey Pines. The best thing about this deal is it’s free. The Century Club of San Diego, a non-profit group of volunteers that hosts the PGA Tour event each year, and tournament sponsor Farmers Insurance have thrown open the gates to the public on Monday and Tuesday. The real tournament action runs Thursday through Sunday, and there’s a Pro-Am on the North and South courses on Wednesday. You have to pay to get in those days. But there’s no charge on Monday and Tuesday. Of the two days, Tuesday is by far the best bet. Most players will be out practicing on the North and South sides of the driving range, working on their putting on the putting green or on the course for practice rounds. Woods’ tradition at Torrey is to arrive just before sunrise on Tuesdays and play either the North or South course. Very few people know Woods’ schedule at these events, but since he hasn’t played Torrey Pines since 2011, the call here is that he’ll be out there on the No. 1 tee on one of those courses on Tuesday of tournament week. The No. 1 tees for both courses are between the Pro Shop and the Pacific Ocean. The first shot off both courses is toward the Pacific Ocean. Rickie Fowler in Round Three at the 2012 Farmers Insurance Open. Photo courtesy of Stan Badz. In addition to Woods, this year’s Farmers Insurance Open has a great field with returning champion Brandt Snedeker and other past champions like homegrown Phil Mickelson (three-time champ, but hasn’t won since the South Course was redesigned for the 2002 season and 2008 U.S. Open), Bubba Watson, who won last year’s Masters Tournament, John Daly and Nick Watney. With Woods approaching 40, there’s a whole slew of younger players who watched him and learned from him when they were youngsters and now want to beat him on the golf course. 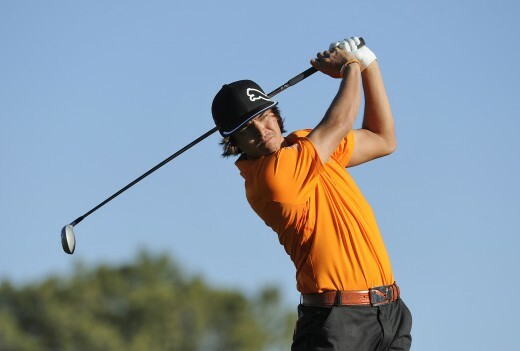 Players like Murrieta’s Rickie Fowler, Dustin Johnson, who won the PGA Tour’s first event this year in Hawaii, and others will be at Torrey Pines trying to start a string of Farmers Open wins of their own. It’s an exciting time at a golf course that serves as one of three San Diego municipal complexes, with Balboa Park Golf Course and Mission Bay Golf Course being the other two. There are very few PGA Tour stops that the average golfer can walk on and play, but Torrey North and South are two of them. The leaders in the Farmers Insurance Open — including winner Bubba Watson —are showered with applause by the gallery as they approach the 18th green at Torrey Pines South. 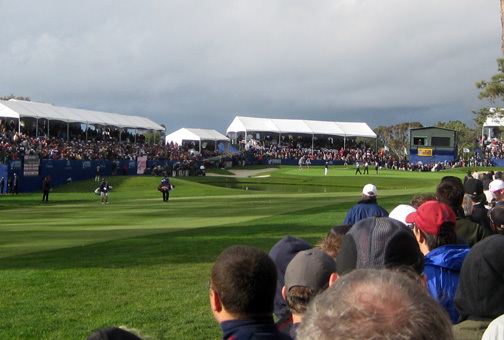 The grandstands surrounding the 18th hole on the Torrey Pines South Course were filled with spectators Sunday, hours before the leaders of the Farmers Insurance Open approached the final hole. As the day wore on, fans began crowding the ropes adjacent to the green and then along both sides of the fairway. By the time the final groups approached, the gallery grew to the point of gridlock. Much of the buzz earlier in the week was the return of Tiger Woods to Torrey Pines, but he would finish well down the leaderboard at just 1-under-par for the tournament. Instead, the story in the tournament’s final stages was a pair of left-handers and a rookie named Vegas. Bubba Watson clung to a one-stroke lead over playing partner Jhonattan Vegas and Phil Mickelson, who was just behind them in the final group, going into the par-5 18th hole. 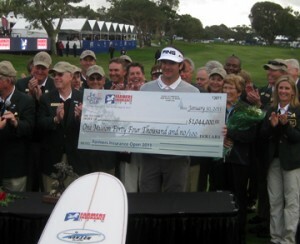 Bubba Watson received a trophy, surfboard and check for $1,044,000 for winning the 2011 Farmers Insurance Open. Watson was on his way to a birdie on the 18th. That meant if Vegas was to catch Watson, he had to go for broke on the final hole and attempt to reach the green in two shots if he was to have a chance at a tie. That made Mickelson the only man with a chance at catching Watson. Sitting 72 yards away from the hole after two shots, Mickelson had to hole out to tie. He walked all the way up to the green, studied the situation around the cup and walked all the way back, fans shouting encouragement every step of the way. Making such a shot would be a miracle for most, but not out of the realm of possibility for Mickelson. Mickelson took his swing and the ball took flight. Mickelson’s caddied pulled the flagstick as the ball headed toward the hole. It hit within a foot of its target, then rolled to a stop 4 feet, 4 inches from the cup. The shot was close enough that the crowd held its collective breath, exhaled an audible groan of disappointment, then applauded the effort. Watson was in the scorer’s tent signing for the 67 on his scorecard when he realized he had won the tournament. “Over the radio they said he missed it, so I teared up a little bit,” said Watson, whose 16-under-par 272 total was one stroke better than Mickelson, who shot a 69 in the final round. It was the second career win for Watson, who earned $1,044,000 for the week’s work. The trophy that came with the victory will go on Watson’s mantle. And the surfboard he also was presented? What he does with that remains to be seen.